WASHINGTON (CNS) — The president of the U.S. Conference of Catholic Bishops said the Catholic Health Association’s acceptance of rules governing women’s access to contraceptive coverage under the Affordable Care Act was “less than helpful” to the bishops’ effort to seek changes in the mandate. “We have not, ourselves as bishops, been able to arrive at the same conclusion, that accommodation with HHS is that easy. There’s no way that we’re ready to say that yet,” said Cardinal Timothy M. Dolan of New York at a news conference Sept. 11 after a two-day meeting of the USCCB’s Administrative Committee. While acknowledging CHA’s expertise in health care concerns, the cardinal told reporters that he appreciated the fact that the organization acknowledged that the bishops remain the authentic teachers of faith and morals within the church. “We really listen to them in a lot of the input they give us. But when it comes to faith and morals that, of course is what this ultimately is all about, they do defer to us,” he said. The contraceptive mandate remains a “high, high concern among the bishops,” he said. The Department of Health and Human Services June 28 issued final rules for implementing the mandate, which is part of the Affordable Care Act. The USCCB maintains that the rules still conflict with church teaching. 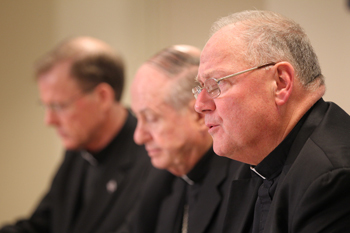 Cardinal Dolan said the conference continues to evaluate what next steps it will take in response. In the final HHS rules, contraceptive coverage for accommodated religious organizations with health insurance plans will be provided separately through health insurance companies or third-party administrators who must ensure that payments for contraceptive services come from outside the objecting organization’s premiums. For self-insuring institutions, a third-party administrator would provide or arrange the services, paid for through reductions in federally facilitated-exchange user fees associated with their health insurance provider. Cardinal Dolan pledged to continue to educate and “rally our people,” challenge the rules in court, and seek changes in the law. “We’re going to continue giving this careful study, but I tell you we still worry … because the problems, the questions we have, remain grave,” said Cardinal Timothy Dolan. “We’re going to continue giving this careful study, but I tell you we still worry about how, if, where we can comply because the problems, the questions we have, remain grave,” he said. The three bishops at the news conference welcomed President Barack Obama’s announcement that he asked Congress to delay a vote on a resolution authorizing U.S. military strikes on Syria in response to the reported use of chemical weapons against civilians by forces loyal to Syrian President Bashar Assad. Bishop Richard E. Pates of Des Moines, Iowa, chairman of the bishops’ Committee on International Justice and Peace expressed hope that a proposal by Russian leaders to place Syria’s chemical weapons stockpiles under international control would lead to negotiations to end the country’s 30-month-old civil war. “It is critical the recent international proposals to secure and destroy Syria’s chemical weapons get serious attention, evaluation and encouragement. As Pope Francis has said repeatedly, dialogue and negotiation are paths to peace, not military attacks and arms shipments,” Bishop Pates said. Bishop John C. Wester of Salt Lake City, chairman of the Committee on Communications and former chair of the Committee on Migration, urged the U.S. and the rest of the world to begin to plan to accept Syrian refugees who may not be able to return home once the war ends. He said some 2 million people have fled Syria to neighboring countries and the 4 million people displaced within the country and that many of them will need homes in the future. Prior to the news conference, the Administrative Committee issued a Sept. 10 statement in support of the humanitarian work of Catholic Relief Services, the U.S. church’s overseas relief and development agency. The statement follows the release of a report by the Population Research Institute that accused CRS employees in Madagascar of distributing contraceptives in opposition to church teaching. Cardinal Dolan said that Carolyn Woo, CRS president, told the bishops that the agency’s principles are clear and that employees are held accountable for their actions. When a problem arises, he said, CRS leaders address the concern as quickly as possible so that all services align with church teaching. “We don’t have perfection here on earth of any organization, but they adhere very strongly in terms of their values and principles … and they will not deviate from that,” Bishop Pates added.